CHSBC recognizes that while the health care system is capable of moving clients back into a community following an acquired brain injury and other disabilities, there is an increased likelihood of being alone and isolated in the community. CHSBC has a strong focus on meaningful community integration and recognizes the importance of supporting clients optimize their personal, social, and vocational skills in order to live successfully in the community. CHSBC supports individuals to develop skills that are required for healthy, independent living. Support may be provided to individuals through one-on-one or group arrangements. Goals relating to community integration and inclusion are client centered and efforts are made to ensure activities are meaningful to the client. Goals are SMART (Specific, Measurable, Acheivable, Realistic, Time-Based) and identified in annual Individual Program Plans (IPPs). All CHSBC employees have an approach that empowers rather than 'does' for an individual. . Clients are supported to problem solve and be proactive about their health which often results in decreased dependence on the health care and emergency response systems. Community-based support services are a critical component in the effective transition of a client back into his or her community. Linking the client to these services as early as possible following their injury improves the chances of a successful recovery. In many cases regular attendance at drop in centres and other meaningful and locally based resources will be built into a client’s weekly schedule. Ongoing recreational and vocational pursuits will be encouraged, as will the development of new and lasting relationships. In all cases, clients are active partners in all aspects of their programs. Throughout our history CHSBC has engaged current clients and alumni in various capacities within our programs to support their vocational and volunteer goals. Former clients have assisted us as mentors to clients, become volunteers, worked as Rehabilitation Care Workers, provided house maintenance and served on our Board of Directors. We believe that providing opportunities for CHSBC alumni to reinvest on behalf of other clients with ABI is a valuable component in maintaining a vigorous organization that continually delivers exceptional client service. 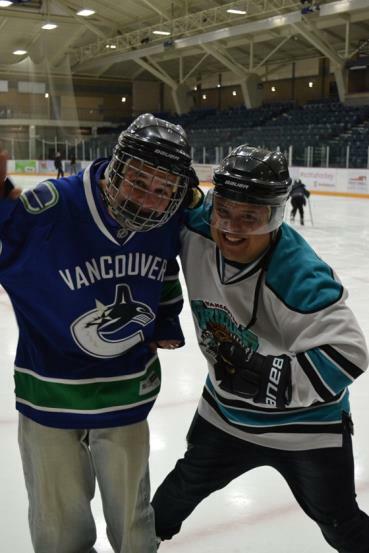 CJ Festejo (right), Manager at Fraser Heights Apartments Program, enjoying hockey practice with a client.